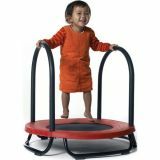 A fun trampoline for the younger child with a focus on safety. 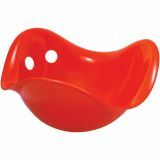 The bright red rubber cover yields protection against the metal frame and the supporting handles are covered with foam to protect children's face and teeth. Spring sheet is less than 5" above the floor. 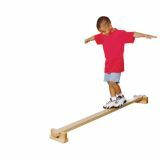 Supports children up to 50 lbs. Ages 3-4. Additional shipping charges apply. 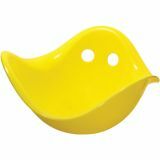 Ideal for throwing, catching, and learning! 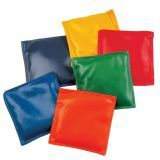 Perfect for tossing games and for developing motor skills, these soft vinyl bags are rugged and hand conforming. 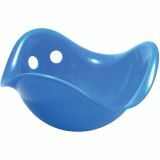 These double reinforced vinyl shells with soft corners are filled with non-toxic plastic pellets. 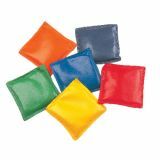 This set of twelve bean bags includes two each in red, orange, yellow, green, blue, and purple. 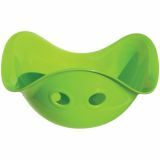 Ideal for throwing, catching, and learning. 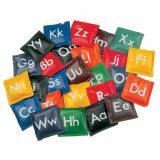 Perfect for tossing games and for developing motor skills, these soft vinyl bags are rugged and hand conforming. 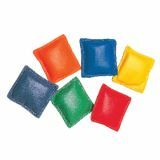 These double reinforced vinyl shells with soft corners are filled with non-toxic plastic pellets. 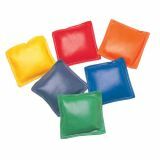 This set of twelve bean bags includes two each in red, orange, yellow, green, blue, and purple.